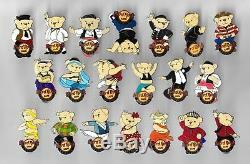 Complete set of all 20 Dancing Bear Series pins - comprising those issued by European Hard Rock Cafe locations in 2007 - PLUS the extra pin issued by HRC Athens in 2008! This set includes several pins which were limited to only 100 issued, so only a maximum of 100 sets of these pins can exist worldwide! Amsterdam (LE 250), Athens #1(LE 300), Athens #2 (LE300), Barcelona (LE 250), Berlin (LE 250), Birmingham (LE 100). Cardiff (LE 100), Cologne (LE 250), Copenhagen (LE 100), Dublin (LE 300), Edinburgh (LE 250), Leeds (LE 100) , Lisbon (LE 150), London (LE 400), Madrid (LE 150), Manchester (LE 200), Munich (LE 250), Nottingham (LE 100), Paris (LE 250), Rome (LE 250). These cute and very popular pins could look truly wonderful if creatively framed. The item "Hard Rock Cafe European Dancing Bear Pin Series 2007 Full Set Lowest LE100" is in sale since Friday, March 30, 2018. This item is in the category "Collectables\Badges & Patches\Collectable Badges\Club & Association Badges\Hard Rock Café Badges". The seller is "outonthewing" and is located in LAUDER. This item can be shipped worldwide.